Marissa King was a member of the Florida Gators from 2010 to 2013. She was part of the senior class that helped lead Florida to its first national championship title in 2013. 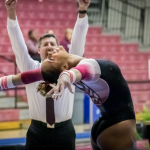 She also earned many individual titles along the way, including three individual regional titles, a national vault title, and 11 All-American honors. Before her career in college, King was a member of the British national team. She represented Great Britain at many elite competitions, including a trip the 2008 Olympics in Beijing and two World Championship appearances. 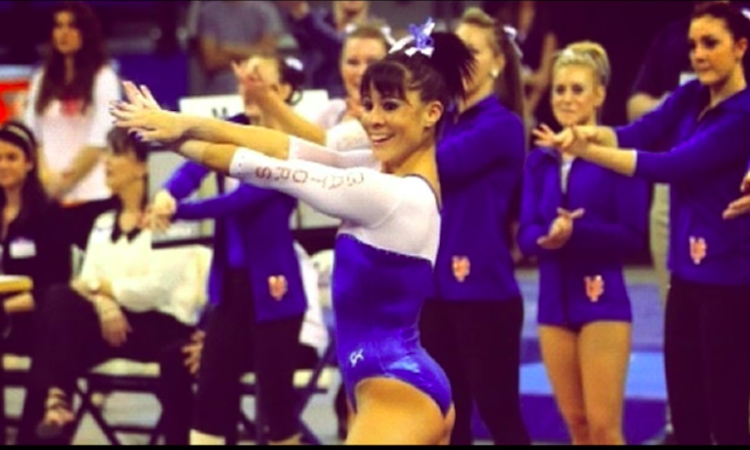 College Gym News: It has been about five years since you graduated from Florida. What are you up to now? Marissa King: I joined Cirque du Soleil. I’ve been in the show Amaluna now for about four years. I’ve pretty much been performing with Cirque since I left Florida. CGN: Where is Amaluna based? MK: Amaluna is one of the world touring shows. I joined the show at the end of the North American tour, then we did two years in Europe and now we’re on the last leg of our two years in South America. After this, I think it’ll go to the States very briefly before we go to China next year. CGN: So you’re doing lots of world traveling? MK: Yes! There’s six big top shows, and Amaluna is one of those six that’s currently touring worldwide. Then there’s a couple residential shows that are stationary: one in Orlando, quite a few in Vegas and one in Mexico. There are also arena shows, which are moving through cities per week, it’s really fast paced. So there’s lots of shows, lots of different types of touring. My show is in a tent, and we’re in each city for six to nine weeks depending on the market. CGN: What was the transition like moving to the United States for college? MK: Oh, massive, oh my god. I remember the first day, I got off the plane and landed in Gainesville and everything was just so overwhelming. It’s hard because people are always talking about how similar America and England are, but the only real similarity is that we speak the same language. A lot of things are really different, and it’s hard to really know or understand that until you live there and have been there for quite a period of time. For me, it seemed like everything was really spaced out, really big — everything was much grander. And I had to get used to take-out life! Maybe this is just in college, but everyone eats out a lot, whereas at home, we go to the grocery store and buy food and then we eat it — we don’t go out all the time. That’s just the lifestyle of fast food and cheaper food in the States. The transition of balancing school with training was also just different. For example, I struggled in the writing classes at first, because British grammar and American grammar are very different. I’d write a paper and I’d turn it in, and then I’d get all these scribbled notes back. My dad is a technical author, so I’d always have him check my papers first. When they came back with all these weird notes, I wouldn’t understand what was wrong with it. I think it was just a grammatical change that maybe they weren’t used to seeing either. Then they’d tell me that that’s not how they write it here, and how it would be written. There’s another funny story, too, about my fringe! My senior year, I changed my hairstyle. I got bangs. I had to get them trimmed every couple of weeks, because they would get too long, and I had more like a curtain instead of bangs. I ignored her because that made no sense to me! I think I got it done in the U.K., so that was a word I had never heard. And she then realized. “Oh no, have you just not been listening to me the last couple of hours because you didn’t understand what I was saying?” We couldn’t believe we were still having terminology problems in my senior year! I think after my first year, though, I really adjusted. I’m quite quick at adapting to new environments, because when I competed for Great Britain, we traveled a lot for international competitions. You don’t have very long to adapt, and to get used to the new equipment or work through your routines. You just have to make use of whatever environment you’re in in order to prepare yourself to compete. When I got to Florida, it was kind of the same. I had to figure out the floor, because Florida has an AAI floor, which is very stiff compared to the Gymnova floor I’m used to, or a JNF floor. That wasn’t too much of a struggle, but just getting used to the way that Americans work within a team environment, and the terminology of what Americans say versus what we say. CGN: What made you decide to come to America for college in the first place? Was it gymnastics? MK: Yeah, that was the biggest opportunity that brought me over. We have a gymnast, Nicola Willis, who competed in 2004 for Great Britain and went to Florida. There were a couple of colleges that were interested in me in 2008, and I expressed that I was interested. My dad was a big believer in putting yourself out there for rare, unique opportunities and going for it. Even if it doesn’t work out, at least you can say you tried, rather than not trying at all and then having the regret of not even giving it a go. So, when the university scholarship opportunities came around, it was something I felt like I needed to try. Even if I didn’t like it, even if I was back after a year, at least I could say I had given it a go, rather than shutting the door completely without even opening it. It was definitely for gymnastics, though. I always saw myself going to university in the U.K., but then when I had the opportunity to do both, and get my degree paid for, that changed things. CGN: Would you ever consider returning to the sport in some capacity? Like competitively, coaching, workshops, things like that? 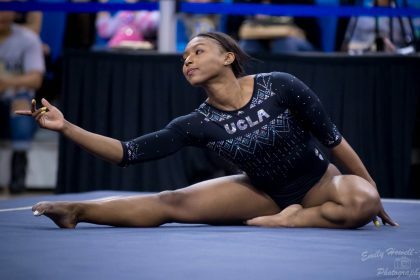 MK: Coaching, private lessons, floor routines, beam routines, those sorts of things, maybe? Competitively elite, definitely not. If I had the opportunity to go back and do college all over again, absolutely! I miss the sport and the competitive side of it in some ways, but then again, Cirque has opened so many amazing, different avenues for me that I’ve always wanted to explore. I really do love what I’m doing now. When I look at all the elite gymnasts that are still going around my age, I don’t know how they’re doing it! Especially with all the rule changes and the Code of Points changing all the time, I don’t know if I could do that now. But I definitely think I could do college again. CGN: How is the gymnastics community different in the U.K. versus what you experienced in the US? MK: Sports in general in America are just so much more of a big deal. Everyone gets so much more involved. I think it’s because in the States, everything is bigger and grander. England as a country isn’t even the size of Florida as a state, so things are smaller. There are more fans in America, and there are so many more people who support the athletes in sports. That’s the biggest difference. We have that in the U.K., but it’s just not to the same extent that it is in America. CGN: What about the atmosphere difference in elite versus in college? MK: I absolutely loved competing in America. It’s just not the same in the U.K., but it’s getting there. For example, our British national championships used to be just in some sports hall with pulled-out bleachers, and there’d only be 300 to 500 people. And now they have it in the Echo Arena in Liverpool — which is a proper stadium — and they now have the competition on podium. During my time, that never existed. When I went to America, I was competing in an arena which could seat 12,000 people and had home meets that were filling at least 90 percent of that stadium; it was just an absolutely unreal experience. I love performing, and I really enjoyed selling myself to the crowd. The way they were just so enthusiastic and into it was really, really special in the States. That’s why I think I really loved competing in college so much more than in the U.K., just because it was so much more fun. CGN: Have you been back to Gainesville since you graduated, or have you been too busy touring? MK: I was able to go back twice. One time, I was able to go back because I had a break, and I wanted to go to senior night. When I was a senior, we won our first championship. The the girls who were freshmen that year — when they became seniors, I wanted to go back for their senior night. We were very, very close as a team, even though they were babies when I was a senior. That year, Bridget [Sloan] was a freshman, as was Bianca [Dancose-Giambatisto], one of my fellow international students. That team was just really special, so to be there for their senior night was something I really wanted to do. Luckily, within the tour plan, we had a break where I could go back to Gainesville for that, which was really, really nice. I went back in May, also. One of the girls, Melanie Sinclair, who was a senior when I was a freshman and now performs with me in Amaluna, got married in Florida. After the wedding, I went back to Gainesville to do a bit of training with Adrian [Burde]. I got on really well with the two assistant coaches at Florida, but of course Robert [Ladanyi]’s at Utah now. Burde is still at Florida, so I went back to specifically see him. I don’t know Jenny [Rowland] so well, but she was lovely when I went. To connect with her, and talk to her about what things are different since Faehn left and how she does things was really interesting. Every time I go back it’s more like, okay, I’ve had my time, it was incredible and I left a legacy behind that I can see is still growing, and I’m happy with that. Going back has been good closure for me. I haven’t felt like I wish I was still in college or I wish I was still competing. It has been more of a happy kind of feeling going back, knowing that I had a great time when I was there, but I’m doing something else great now that I’m very happy with. 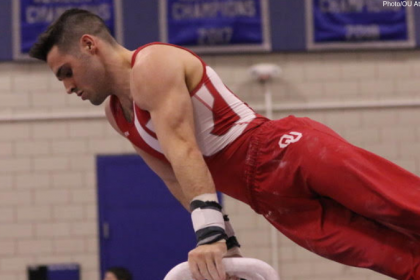 CGN: How have you taken what you learned in gymnastics and applied it to your adult life and your career? MK: Gymnastics teaches you to be very disciplined. Everyone goes through a phase where you try to be the rebel, you try not to do the numbers or you have an attitude against your coaches in the gym or something. But I think once you get over that, you learn to be disciplined. Gymnastics disciplines you in such a way that you can really apply it to your everyday life. A big example for me right now is that I’m on a two-month break from work. 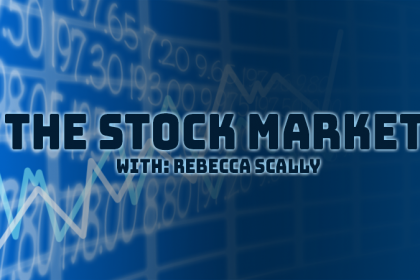 We’re touring South America, which is a very volatile market, and we were supposed to be in Peru for about a month and a half. They last-minute cancelled the city and sent all of us home on a two-month break. It is the longest break I’ve had since I’ve been with the show. We’re required to stay fit because it’s our job, and we have to go back and perform. Being so disciplined from gymnastics and staying in shape has been massively useful, especially now knowing that it’s my job on the line if I don’t stay in shape. I’m applying what I’ve learned in order to keep myself fit and healthy during this break. Everyone in Cirque is very professional with what they do, but it’s especially important with my group. As females we get weak quite quickly. We have to make sure we keep up our strength and conditioning, as well as rehabbing and knowing what areas are weaker than others. I feel like I still do the conditioning type of exercises that I did when I was in elite, because those are the core strength skill sets that we need and still use on a daily basis. And outside of conditioning and sports and working out, problem solving is another big takeaway. You always come up with a plan for preparing yourself for that big competition of the year, or in college, it was more how to maintain yourself for those four crucial months of season. Now it’s learning how to prepare myself for going back to work and then maintaining myself throughout the entire year. And communication, too; communication is something you really need to learn how to do, especially as you get older. In gymnastics, it’s with your coaches, but that translates a lot to relationships. My boyfriend and I do distance, and you have to communicate all the time. He always asks me how I’m feeling or how things are going, and I usually wouldn’t want to talk about those types of things, but you have to. CGN: What are your goals for your future, both in your career and in your personal life? MK: Career-wise, I’ve always wanted to do more than one show. Amaluna is my first show; I’ve been doing that for four years, and I’m looking to grow and experience something beyond just this show. In the near future, I’m looking to expand and become a better artist by trying something new in a different show within Cirque. I’m very happy in work, I really enjoy my job. I love touring. I feel very lucky that my body has managed to hold up this long because a lot of gymnasts burn out, so that by the time they finish college, they feel that they don’t have any fuel left in the tank. I definitely didn’t feel like that at all, and that’s probably what has kept me alive in Cirque for as long as it has. People always ask me what I’d be doing if I weren’t in Cirque, and I don’t really know! I tried an office job for a very short period of time and I just can’t do that. I don’t know how people can do the whole sitting in front of a computer thing every day, Monday to Friday. CGN: What do you miss most about Florida? MK: I really miss the team, for sure. I don’t miss the training so much, but I miss the people. We had such a special team when I was a senior. If I could go back and be with my team in 2013, that would be great. Competing in the O-Dome — there’s no other feeling that will ever be able to compare to running out of that Gator head into the O-Dome in front of all your fans that have watched you throughout your entire career, fans that look up to you and are inspired by you. I still get people that write to me, who ask how I’m doing, and they follow my travels. It’s nice that I’m remembered. I didn’t expect that, since it’s been several years now. Florida will always hold a very special place in my heart, as will the girls and the team that I was with. I do miss it, for sure, when I talk about it now and look back. At the same time, I’m very content and happy and proud of where I’m at now. CGN: What’s the one thing you would say to this year’s graduating class of NCAA gymnasts as they go out into the world? MK: It’s crazy when you graduate! It’s so scary, because unless you have that degree where you know exactly what you’ll be doing, you’re going out into the world of the unknown. It is intimidating, because you’re leaving behind something you’ve loved doing for the last four or five years. Some people don’t want to leave that behind, but I think I’d say that life is a journey, and don’t be afraid to continue and always look back and be happy with what you’ve done. Be excited with your journey and your new direction in life. Fantastic interview. Marissa is one of my all-time favorite gymnasts, both in elite and NCAA.